Southwestern corrugated pottery consists mainly of utilitarian or culinary jars displaying distinctively textured exterior surfaces, but lacking slip and paint. The textured surface was produced by not obliterating or smoothing the thin coils or ropes of clay used to construct the vessels creating a horizontally ridged appearance, hence the name corrugated. From the late tenth through early thirteenth centuries AD, ancestors of the modern Pueblo people across most of the northern part of the American Southwest (Figure 1) adopted a variety of corrugated pottery referred to as all-over, or full-body indented corrugated. This form of corrugation has systematically pinched or indented coils left exposed over the entire exterior surface of the vessel. Precursors to full-body corrugation had unindented exposed coils restricted to the neck portions of the jars, and are referred to as neck-banded pottery. Earlier still, culinary vessels had entirely plain surfaces produced by scraping both interior and exterior surfaces until the coils or other construction elements were completely obliterated (Figure 2). The all-over indented corrugated technology continued until the fifteenth century when Pueblo potters returned to plain-surfaced cooking pots. Although it took some time to work out this general sequence of technological change, speculation as to why Pueblo potters manufactured corrugated pottery began almost immediately after the existence of corrugation became known to Western scholars. As the rest of this chapter recounts in detail, the problem of corrugated pottery has been recognized and puzzled over by archaeologists off and on over the last century. During this time, a variety of different possible explanations have been advanced, but no convincing or lasting resolution to the problem exists. In fact, recent experimental research has cast doubt on some ideas regarding the advantages of corrugation that have been dogma among archaeologists for many years ( Schiffer 1990; Young and Stone 1990 ). Consequently, the problem of explaining the development of corrugated pottery is ripe for a concerted research effort. Figure 2. Examples of plain, neck-banded, and full-body corrugated vessels from the American Southwest. From left to right, the vessels are Chapin Gray (5MT2181, RC1) Moccasin Gray (5MT3868, Vessel # 26), Mancos Gray (5MT89, RC1), and Mancos Corrugated (vessel 2-975 from the Chappell collection). All vessels are curated at the Anasazi Heritage Center in Dolores, Colorado. Shortly after the end of the Mexican War and the acquisition by the United States of what is now the American Southwest in 1848, U. S. military, survey, and exploring expeditions began to document this vast new territory. Reports produced by some of these expeditions contain the earliest published records of corrugated pottery. Simpson (1850) and Whipple et al. (1856) present illustrations of pottery encountered on ancient Pueblos including examples of corrugation. As part of their report on surveys west of the 100th meridian, Putnam and others (1879) noted the presence of coiled ware and indented pottery on sites in New Mexico and Arizona, but offered no further details. It was William Henry Holmes, as a member of the Hayden expedition to southwestern Colorado and southeastern Utah, who produced the first scholarly account of corrugated pottery. In his report, Holmes (1878) coins the term "corrugated" in reference to the pottery's horizontally ridged appearance, and offers a simple reconstruction of how corrugated vessels were manufactured. In addition, he notes that modern Pueblos no longer produce this type of pottery, and observes that the forms of vessels produced by corrugation appear to be limited to jars and thus are considerably less varied than the forms of painted wares. Eight years later, Holmes (1886) published a more thorough treatment of corrugated pottery, and, along with Frank Cushing (1886), proposed the first explanation for the development of corrugation. Holmes notes that while coils are frequently used in pottery construction, leaving these coils unobliterated is a unique and striking aspect of Pueblo pottery. He was impressed by the craftsmanship involved observing that: "So thoroughly were the fillets pressed down and welded together that the vessels seldom fracture more readily along the lines of junction than in other directions." He also notes that examples exist in which corrugation occurs over limited parts of the vessel, particularly necks, the rest displaying a plain surface. Addressing the use of corrugated vessels, Holmes is the first to argue that they served mainly culinary uses because their exterior surface is commonly covered with soot, and modern Pueblo tribes cooked with vessels of similar form. Ordinarily the coil has not been expected to contribute to the beauty of the vessel, but the Pueblo tribes made it a prominent feature in decoration. The primitive potter as he laid his rude coils noticed that the ridges thus produced served to enhance the appearance of the vessel. He also observed that the series of indentations left on the outer surface of the fillet in pressing it down gave a pleasing effect, and made use of the suggestion. Improving on the accidents of manufacture, he worked out a variety of decorative devices. Based on corrugation's visual resemblance to basketry, its absence from modern Pueblo pottery technology, and its association with earlier black-on-white painted pottery rather than the more recent polychrome wares, Holmes suggests that corrugation was the most archaic form of ancient Pueblo pottery. This erroneous reconstruction of the temporal placement of corrugated pottery also led him to believe that the idea for corrugation may have been inspired by basketry. ...she [the potter] pursued the process she was accustomed to in the manufacture of the basket bottle. That is, she formed a thin rope of soft clay, which, like the wisp of the basket, she coiled around and around a center to form the bottom, then spirally upon itself, now widening the diameter of each coil more and more, then contracting as she progressed upward until the desired height and form were attained. As the clay was adhesive, each coil was attached to the one already formed by pinching or pressing together the connecting edges at short intervals as the winding went on. This produced corrugations or indentations marvelously resembling the stitches of basket-work. Hence accidentally the vessel thus built up appeared so similar to the basket which had served as its model that evidently it did not seem complete until this feature had been heightened by art. At any rate, the majority of specimens belonging to this type of potteryÑespecially those of the older periods during which it was predominantÑare distinguished by an indented or incised decoration exactly reproducing the zigzags, serration, chevrons, terraces, and other characteristic devices of water-tight basketry. ...When, in the evolution of the pitcher, this type of basket was reproduced in clay, not only was the general form preserved, but also the details above described [strap handles]. that is, without reference to usefulnessÑin fact at no small expense of troubleÑthe handles were almost always made double; indeed often braided, although of clay. Frequently, especially as time went on, the bottoms were left plain, as if to simulate the smooth skin-bottoming of the basket-bottles. Thus, with very little chronological information to go on, Cushing, Holmes and others working at that time (e.g., Nordenskiold 1893:79-82) focused on similarities between corrugated pottery and basketry to construct their explanation of the development of corrugation. The intent of ancient potters to make vessels as visually similar to basketry as possible stood as a viable explanation for corrugation as long as the notion held that corrugation was the earliest pottery. However, this notion did not last long. Pottery it was agreed, is at the present time the most abundant, convenient and reliable criterion, and the cooking wares the simplest type for preliminary chronological determinations. Discussion brought out the following outline of development in this class of ceramics: first, plain wares; later, neck corrugations produced by leaving unobliterated the upper structural rings; still later, spiral corrugations ornamented by indentations and covering the entire vessel; again later, a degeneration of the corrugation technique, and finally disappearance of corrugations and return to plain surface pots. These changes in the utility wares also served as important criteria for distinguishing the different Basketmaker and Pueblo periods in the new classification scheme that emerged from the first Pecos Conference, and these criteria are still in use today. Establishment of the proper chronological relationships between plain and corrugated pottery together with an increasing appreciation for the technical skill required to produce corrugated vessels led Morris (1917) and Kidder and Guernsey (1919) to reject the earlier, basketry inspired, explanation of corrugation presented by Cushing and Holmes. However, neither Morris nor Kidder and Guernsey offered an alternative explanation. This problem was not addressed until 1936 when Kidder (1936), in his superb treatise on the culinary wares from Pecos, presented a new explanation for the development and adoption of corrugated pottery. Kidder continued to view corrugation as a form of decoration, but rather than representing the initial attempts at pottery making, he saw corrugated pottery as the culmination, or apex of culinary ceramic art. To Kidder, the changes in utility wares were a natural outgrowth of the development of Pueblo society. The development of corrugation came from a combination of increasing technical skill, play, and great cultural vitality. 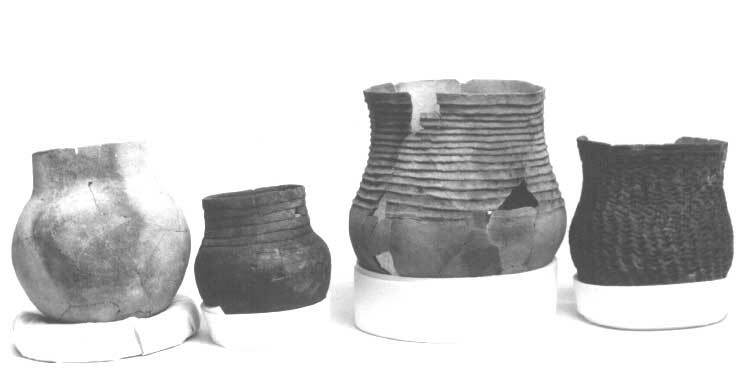 For example, he argues that the indented corrugated vessels of the Developmental Pueblo or Pueblo II period "are, indeed, exactly what one might expect from potters, who, during a period of vigorous cultural growth, and unhampered by convention, were experimenting with a new and fascinating method of handling a responsive and plastic medium" (Kidder 1936:301). In addition, he notes that the most elaborate and skillfully produced corrugated vessels were made during the Great Pueblo period, at a time of "more highly evolved communities" and "the Pueblo Indian's greatest cultural vigor" (Kidder 1936:301). Kidder also suggests that the decline in corrugation after the Great Pueblo period resulted from reaching the limits of possibilities for elaboration of the technique, and, thus thwarted, Pueblo potters turned their decorative attentions to the greater possibilities offered by new forms of painted pottery. In essence, Kidder's explanations for change in utility wares rest on the intuitive assumption that the potters are naturally or inherently motivated to decorate their pots. And, with sufficient technical expertise and freedom afforded by a prosperous culture, potters will pursue this inclination to a point of extreme elaboration. Thus, although Kidder's explanations differed in detail from that of Cushing and Holmes because the understanding of what needed to be explained had changed, they stemmed from the same basic assumptions about human nature. Because these assumptions were taken to be obvious and self- evident, no consideration was given to the need to test either the particular explanations or their underlying assumptions. Shortly after Kidder's publication and despite his assertion that corrugation "served no useful purpose whatever," possible functional explanations for corrugated pottery began to be articulated. Although Holmes (1886:275) and others (e.g., Morley 1908:609) had noted early on that indenting exposed coils probably strengthened the weld between coils, they still saw corrugations as primarily decorative. In the 1940s, other possible functions of corrugation began to be discussed on a more equal footing with decoration. For example, in his survey of Southwestern archaeology, McGregor (1941:255) states that: "Various writers have suggested that indented corrugations were made not only as a form of decoration but also to serve a definite utilitarian purpose by increasing the surface of the outside in relation to that of the inside of the vessel. This, it is felt, would gather heat over a large area and concentrate it in a much smaller area on the inside of the pot, thus making the contents cook more rapidly than in a vessel with a plain surface." Linton (1944) also observed that the development of corrugation coincided with an increase in the size and relative abundance of these culinary vessels, features which he suggests indicate a greater reliance on boiling to cook food. Unfortunately, Linton provided no argument linking corrugation with the increased use of boiling. Despite growing discussion of the possible functional aspects of corrugation, most archaeologists working in the Southwest at that time rejected functional arguments as viable explanations. McGregor's comments on the matter likely typify the views of the time: "this [that corrugation could have been developed to promote heat transfer] credits the makers with more reasoning intelligence than they probably possessed in such a matter" (1941:255). Here, we see the intrusion of common sense reasoning in the process of explanation. In the opinion of the archaeologists of the time, ancient Pueblo potters could not have understood the relationships between surface area and heat transfer, and thus could not have intended to produce pottery taking advantage of these properties. Consequently, this functional explanation could not accurately account for the development of corrugation. The notion that corrugation was developed as a decorative elaboration of otherwise mundane utility ware continued to be the principal, if not exclusive, view well into the 1960s ( Gifford 1978). As a result, the little interest paid to utility wares after Kidder and Shepard 's treatment in 1936 and before the 1980s consisted mainly of creating types which could be used as style markers for the temporal and spatial identification of traditions and cultures (e.g., Breternitz et al. 1974; Colton 1955, 1958; Colton and Hargrave 1937; Gifford and Smith 1978; Rinaldo and Bluhm 1956; Wendorf et al. 1956). Opinions regarding corrugation began to shift to a greater emphasis on functional explanations during the 1960s (e.g., Linne 1965). This shift coincided with the growth in popularity of the more functionally oriented New Archaeology (see Dunnell 1986 for discussion of the rise of the New Archaeology). Because practitioners of the New Archaeology saw culture as a functionally integrated system, they had difficulty accepting the notion that ancient Pueblo potters would have chosen to invest additional energy in decorating their cooking pots without some benefit besides aesthetic appeal. Although decorative or stylistic treatments of corrugation continued (e.g., Pendleton and Washburn 1977; Popelish 1986a, 1986b; Stone 1986), by the 1980s and early 1990s most accounts of the adoption of corrugation cited some benefit it offered over plain pottery. Proposed benefits included more effective heat transfer (by far the most common suggestion), greater ease of handling, improved durability, or reduced production costs (e.g., Blinman 1993; Gumerman 1984:79-80; Rice 1987:232; Vivian 1990:146). Even studies that continued to conceive of corrugation as decoration began to cite functional benefits of decoration in the form of increased information transmission potential for marking social boundaries (e.g., Brunson 1985; Plog 1986). Although consensus had shifted to functional accounts, the mechanisms of change continued to be conceived in common sense terms. Most of the functional accounts rely on a vague notion of improvement; ancient potters were constantly motivated to reduce the cost or improve performance of their craft. In some cases, corrugation is thought to have been consciously developed and adopted to cope with or adapt to some external condition. For example, Vivian (1990:146) argues that as fuel resources were depleted, potters were motivated to develop corrugation to make cooking more efficient by improving heat transfer. However, if this was the case, it is unclear why corrugation was first employed on the necks of vessels rather than their bases. 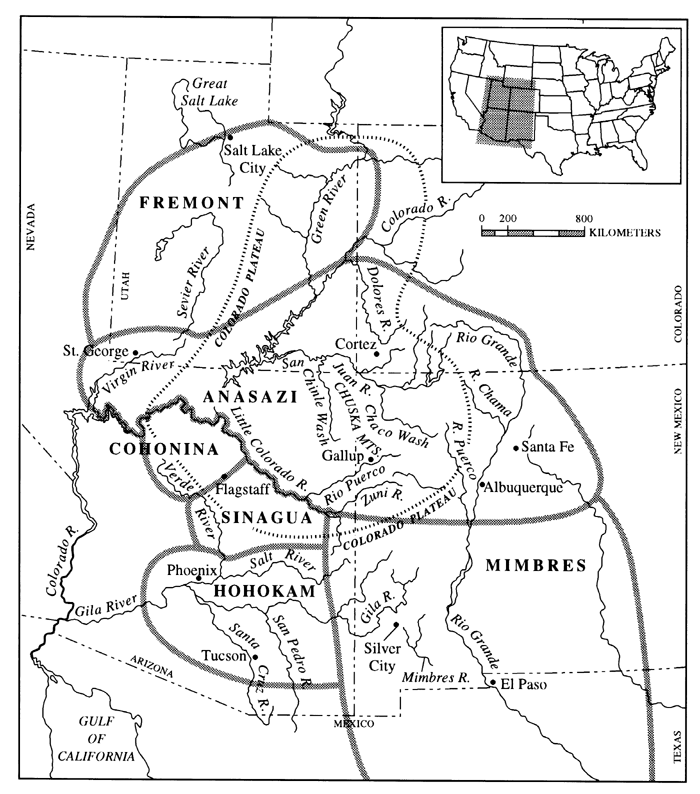 It is equally unclear why Pueblo people ultimately abandoned corrugation and returned to plain-surfaced vessels because it is unlikely that the abundance of fuel wood increased in the fifteenth century. Recently, functional explanations of corrugation have fallen on hard times. This is due in part to a general shift away from simplistic functionalism among archaeologists because of revival of interest in historical processes and forms of explanation brought about by potent philosophical and theoretical attacks from advocates of post-processual and evolutionary approaches. However, there have also been some empirical stumbling blocks. Just as the advocates of decorative explanations had assumed the functional equivalence of plain, neck-banded, and corrugated vessels, the benefits of corrugation proffered in functional explanations were based mainly on assertions and speculation, not measurements. Confidence in these assertions began to erode when initial attempts to test experimentally the common claim that corrugation improves heating effectiveness failed to yield the expected results ( Plog 1986; Schiffer 1990; Young and Stone 1990). Additional small scale experiments by Schiffer et al. (1994) and Blinman (1993) further underscore the recognition that the cost and performance consequences of corrugation are anything but clear-cut. More than 100 years have passed since Holmes and Cushing presented the first attempt at explaining the development and wide-spread adoption of corrugated pottery in the American Southwest, and yet we have made very little progress toward reaching a viable and compelling explanation. Archaeological research has improved our understanding of certain aspects of the corrugation problem. We now know the general sequence of change from plain to full corrugation and back to plain vessels. We also have a better appreciation of the complexity of the cost and performance differences that are likely to exist between plain and corrugated vessels. However, theoretical and empirical problems continue to impede explanatory progress. In this brief historical review, I have documented how implicit common sense notions have underlain each of the attempts to account for corrugation. Relying on common sense in the place of explicit theory has failed to yield robust, empirically justifiable explanations not because these notions are necessarily wrong or scientifically invalid, but because they are generally unevaluated, which results in short-cutting the research process. By generating explanations from implicit assumptions about human motivations, archaeologists have been able to offer superficially plausible and satisfying accounts even without secure, detailed knowledge of the history and impacts of the technological changes involved. This has served to divert attention away from serious attempts to address the problem. In fact, some of the changes that have occurred in what is considered a reasonable or appropriate form of explanation of the rise and fall of corrugation have taken place in the absence of any change in our empirical knowledge. Rather, these shifts have followed larger social and political trends just as some critics have argued for the social sciences in general. To improve on these earlier efforts to answer the question "why corrugated pottery?" I will attempt to replace these unevaluated common sense notions with explicit theory and rigorous empirical investigation while building on previously generated data and insights.